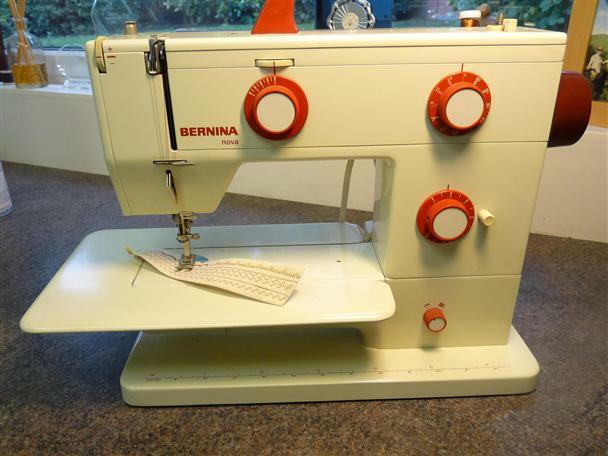 A Genuine Bernina Nova 900 Swiss made Bernina, the Rolls Royce of sewing machines! The 900 Nova is a traditional mechanical sewing machine that provides more than enough basic functions for everyday sewing tasks. It comes in a robust metal case and stores away nicely along with all its accessories. The machine offers 7 stitches, buttonhole, straight and zig zag stitch and a blind hem stitch. A range of feet are included such as blindstitch, zipper, embroidery, buttonhole, overlocking and darning foot. With this machine are a foot control, hard cover & accessories pack. Used but in great condition for its age (carry case needs a good clean) . This machine has been fully serviced.